In recent years the Accessorize brand has impressed me season after season and the SS14 range is another triumphant collection in my eyes. I used to find some items overpriced however the amount of compliments i receive when wearing an Accessorize piece make me happy to pay that little extra for such beautiful and individual styles. I love the mix of statement jewellery, playful colour/print and the quirky pieces such as the camera shaped bag below as well as the traditional items the brand is well known for. I already own the Rio Ultimate necklace, couldn't resist this stunning pastel piece, it looks fabulous with my spring wardrobe and the animal snood is a piece that the lovely @FashionLind couldn't resist, check out how she styles it on Instagram. I need to find the sunglasses in my local store and see how they look, as i have always worn black or tortoiseshell sunnies i don't know how these will look on but excited to see and embrace a bolder style. The last piece i am in L♥VE with is a gorgeous embellished breton stripe clutch that i spotted in Look magazine last month, at £32 it is a little more than i would normally spend on a clutch but it is just so beautiful i must have it - just waiting for a tweet to tell me it is in stock! 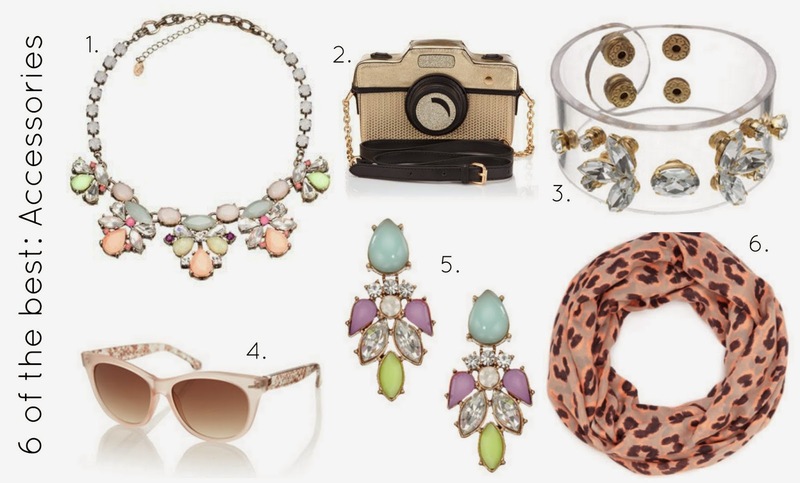 For these lovelies and many many more check out www.accessorize.com - enjoy.